Looking for ways to make traveling more eco-friendly? The GO! SAC Carryall Reusable Tote Bag is a jet-setters best friend. GO! SAC's reusable tote bag conveniently folds into its attached zipper pouch, making it an easy addition to another piece of luggage for souvenir storage at the end of your journey. Even better? The tote bag's built-in trolley sleeve (it slides over rolling luggage bags' handles!) and extra front pocket make it a perfect around-the-globe companion. Whether you're on the search for reusable tote bags, travel bags, gym bags for men, gym bags for women or an all-around sports bags for any on-the-run activity, go for a GO! SAC. Made of lightweight DURALON®, each GO! 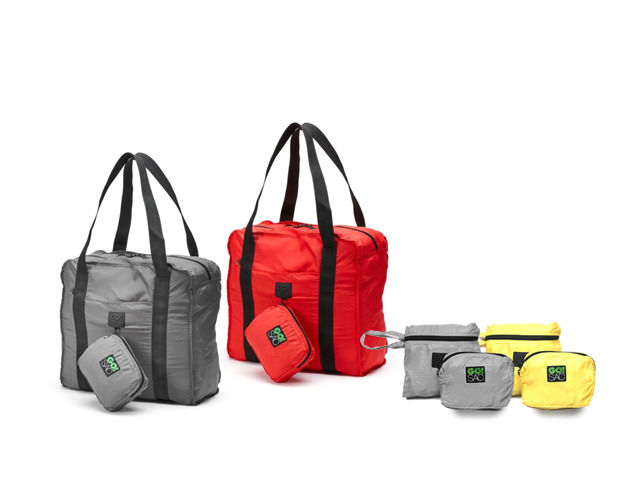 SAC is water- and stain-resistant and machine washable. With a 30-pound carrying capacity, these reusable bags are super versatile and ideal for travel, the beach, camping, the gym, shopping and so much more. * All currencies are in Canadian dollars. Prices listed are final. Copyright 2019 SuperCard Club. All rights reserved. Site designed by eSeeNet.com Ltd.